Gloucester director of rugby Nigel Davies says there was no choice but to go to uncontested scrums for the last 21 minutes of their defeat by Bath. A fiery game saw two red cards and five yellows given out, leaving Gloucester with no available tight-head prop. There was a suggestion that Dan Murphy could play there, having performed in that role at London Irish in the past. "He is simply not a tight-head, there's not an argument and people in the game should know better," said Davies. "It's the most technical position on the rugby field, he hasn't played tight-head for us since I've been here and long before that. "So if anybody suggests he should go tight-head they're talking absolute rubbish as it would be dangerous to put a guy who's not played tight-head for at least three years." 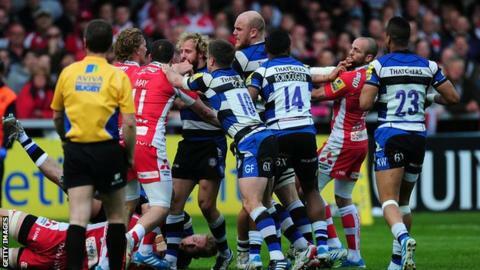 Bath won the match 18-17 with a late penalty try, securing a first league league win at Kingsholm since 2006. Toby Booth, who worked with Murphy at London Irish before moving to Bath as a coach, had seen him perform in the number three jersey and was disappointed the scrums could not stay competitive. "The uncontested scrum thing was a massive blow for us because obviously we're in a situation where we believe we're going to have dominance," Booth told BBC Radio Bristol. "That is disappointing in this day and age and especially as we believe they had a player on the bench that was possibly capable of doing that." Both sets of coaching staff were also unhappy with the performance of referee Tim Wigglesworth as seven cards were handed out in the game. "There is some clear and obvious stuff that we can't control and the lack of consistency in officiating is not good enough and ultimately probably cost us the game," Davies told BBC Radio Gloucestershire. "I think what we got at the end of the game was a bit of a farce and there is a lot of frustrations within the players because of the inconsistency throughout the game." Afterwards the Bath head coach Mike Ford was asked if the Rugby Football Union should launch an enquiry into the game, and he said: "I think so. "The referees have got to understand what is going on out there. It's crucial, absolutely crucial. Why he never used the TMO [television match official], I don't know. "I am not here to call the referee at all, honestly. I just want to be positive on what we have done." Gloucester also revealed that a teenage boy on a rugby tour threw a soft drink bottle at the officials at the end of the game and they are working with his team to agree appropriate action to take.